For the last several years I’ve been searching for a home church. Once I moved to DC, my original church was too far away; the churches I’ve attended in DC have been more about politics, and a recapitulation of the nightly news, than about the scripture and what it means. In my short time on earth I’ve run the gauntlet raised as a strict protestant fundamentalist to eventually oscillate to the other extreme during college where I existed as a Christian in name only, claiming God’s love and mercy essentially meant that “everything goes.” After college I discovered the Episcopal Church and was confirmed in it, but that has increasingly lead me to institutions filled with political rhetoric and whatever is popular in the mainstream and hasn’t sustained my need to learn and move closer to God. So here I am now – still searching for the sweet spot that blends what I see as God’s mercy and love with the fundamentals of a righteous life where, naturally, not everything can or should go. Enter Dancing Alone, which arrived as a present in the mail from my mom, who is also running through a similar spiritual exercise and the long and tiring journey to find a church that, while not perfect (impossible) at least tries to be as Christ like as possible. When I first started reading Dancing Alone I was both drawn to and repelled by author Frank Schaeffer’s strident voice. It has an undeniable quality of judgment, something I usually react negatively towards thanks to my fundamentalist past (everything sent you to hell, and everything was about outwardly following rules, but love was replaced by a sense of superiority and dullness). Yet, there is something also appealing in his tendency to unashamedly call a spade a spade – it is his story, after all. I identified with the exasperation, the disgust at churches who follow man-made rules just to “earn” a ticket into Heaven, bypassing the necessity of love and worshiping God. I also identified with his experiences of modern liturgical churches (and old timey protestant churches) that were more interested in making a socially acceptable, popular statement, than in talking about our shared history and duty in Christ. That’s not to say that Schaeffer doesn’t get a bit pedantic himself, downright repetitive at times, and in so doing refutes the positive sides of churches he rejects, namely Protestantism. What’s interesting here is the unique historical focus. 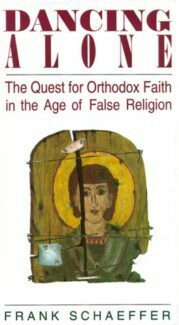 Schaeffer argues, convincingly I might add, that original Christianity, taught by Jesus directly to the apostles and then handed down, verbally – doctrines alongside Tradition and the entire concerted effort of the ancient church – forms orthodoxy. Eventually, about 400 years later, the New Testament (as we know it) was collected and agreed upon, further solidifying interpretations of Jesus’ message, his explanations of everything from parables to the way in which a righteous life should be lead. This then was Orthodoxy. Much later in 1054 there was a schism resulting in the Roman Catholic Church breaking away from orthodoxy. From here, the Protestant schism later arose. This timeline which Schaeffer then walks us through has a point: showcasing how the original understanding and application of Christianity, especially its liturgical, traditional form of worship and interpretation were later usurped, mainly for political reasons but also for well-intentioned reasons of cleaning up corruption which had spread throughout the church. Schaeffer argues, sometimes eloquently and sometimes like a bull in a china shop, that these schisms were throwing out the baby with the bathwater instead of fixing the issue and continuing as a community. This really is the central theme which each chapter, in no particular order, seeks to prove. We hear that Orthodox churches can still evoke the timeline for their bishops, who were trained by proper bishops, all the way back to the original apostles, supposedly legitimizing the correctness of the Orthodox understanding as it was handed down directly from Jesus to the apostles to the present day figures in the robes leading Orthodox services. Schaeffer’s point is then two-fold: liturgy is necessary, is the way Jesus founded the church, and the Bible isn’t always pretty, isn’t always in agreement with our supposed modern sensibilities and understandings. Where Schaeffer can somewhat lose his point is in the relativeness of saying this same thing with no seeming organization to the chapters or the flow of an argument, underlying that sub-current of a rant. Where I diverge is partly my own history, partly a cultural issue, and partly that innate anti-fundamentalist sense in me that seeks rebellion at all costs. Schaeffer has some solid points about the failures of Protestantism, yet he also throws out the baby with the bathwater. What Protestantism has that is its main strength, and to him one of its unforgivable weaknesses, is the focus on a personal relationship with God. Schaeffer highlights all the issues here, many of which are self-evident. This type of “God is my buddy” approach leads to everyone interpreting everything differently and endless chaos because, of course, God just so happens to see things your way. It devalues the need for a community and for a patient, studious attempt at truly understanding God and his Word based on history plus the wisdom of those who have puzzled and debated before us (namely the church Fathers). But I still don’t feel that Protestantism and its personal savior approach is all wrong. Taken to the reverse extreme, as everything always is, it goes back to the old fundamentalist go to church, mark the check boxes, say the words, agree with the people, and do things as your great-granddaddy and his great-granddaddy before you has done. No, we can’t just rework everything because we are so modern, so evolved, so in tune (how many generations have hilariously proclaimed the same and now lie desolate in the textbooks of history, a mockery for their ignorance.) Yet – if you don’t have the personal love and relationship with God, to my way of thinking, Tradition and all its trappings are meaningless, something you do to go through the motion with no heart. Now, Schaeffer acknowledges this to a degree, but I feel it could be stronger. The protestant schism came about for a reason – something to correct after hundreds of years had left the people cold. It’s not just about doing the socially acceptable thing to do, but wanting to and actively loving God. This also is where I get my hackles up that the Orthodox Church won’t share communion with Christians not baptized into their Tradition. It seems to be saying, like the fundamentalists, that only those belonging to the right church go to Heaven and while Schaeffer says this isn’t the case, he seems to include other denominations as riding Orthodoxy’s coat tales into heaven, forgiven by God for being too ignorant and misguidedly well intentioned to see the right place to be. Cue that rising of rebellion in me again. I just don’t think it’s that simple, something that a blanket statement can cover. God has always proved both merciful and complex. It would be nice if Schaeffer spent a little more time noting this and the fact that you don’t have to be Orthodox to get your heaven card stamped. He says it, but more as an afterthought and less as a conviction. My second point is harder to make – perhaps because it confuses me. Schaeffer denotes, repeatedly, how each ordained priest in orthodoxy can trace their teachers back all the way to the apostles. Great… but how? How is this proven? Of course, my question has its own answer – that’s something the individual church has to trot out and verify; still, I wanted a little more explanation on how this is guaranteed and how it can be showcased as truly proven, or at least somewhat vetted by the layman before trooping into any church. Despite the fact that I’m just as harsh of a critic as Schaeffer (years of reviewing does that to you), Dancing Alone has me almost convinced. 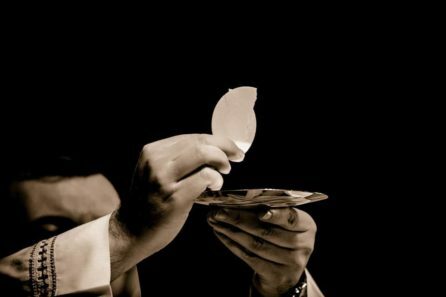 Certainly intrigued to learn more, to perhaps even bite the bullet and try out an Orthodox church (even though with my fundamentalist baptism and my later Episcopal confirmation I won’t qualify for the sacrament of Eucharist unless I become a member). Schaeffer has a great deal of passion and many solid points, and if I can follow this proof of a lineage to the apostles, if I can get my teeth a little more into the meat of that argument, I just might be ready to make the first, tentative plunge, despite myself.